Frank’s workshop with a nice Sieg KX1 CNC mill, and on the top right the computer screen showing the controller software. I was of course intrigued, and Frank showed me how to make a part from start to finish, e.g. from CAD drawing to finished part. I went for something a bit smaller, as I won’t be making any clock parts, and chose a Chinese 3040T with 4 axes. I went for the USB version, as it’s harder and harder to find old computers with a parallel port, and I certainly don’t have one. 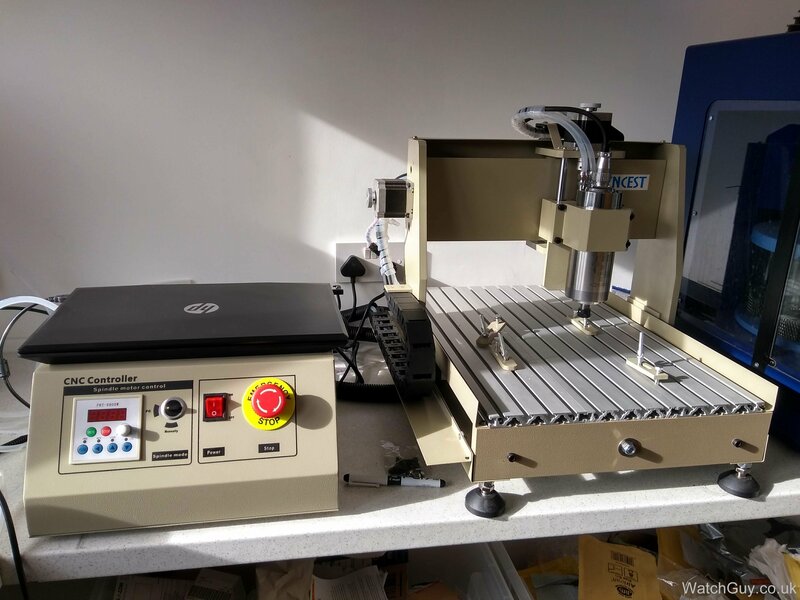 The CNC mill is surprising value for money – for under £800 including shipping, you get a 24,000 r.p.m. water-cooled spindle, a fourth axis motor with chuck, and the controller with USB port. No idea how they do that! On top of that, you need an old laptop that’s running Windows XP, as the software only runs on XP, and it needs to run on a dedicated computer that isn’t doing anything else. I started off with a virtual XP machine on my new laptop, but even though it works, I don’t want it next to a machine sputtering oil and metal bits, so I bought an old XP laptop on eBay for £44. 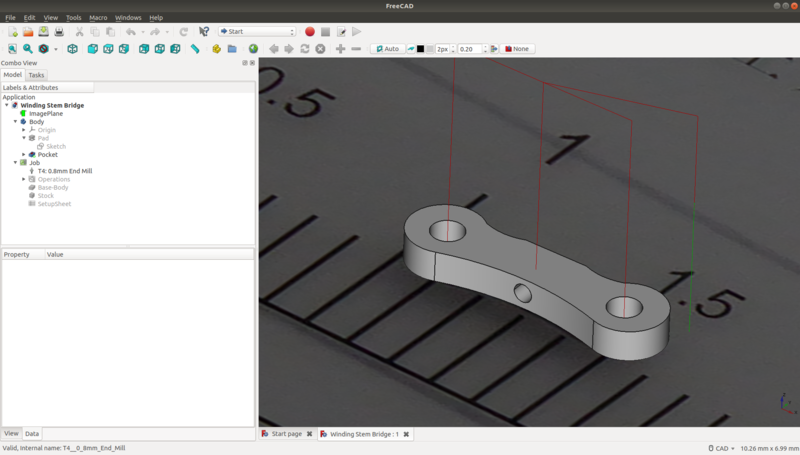 To get anywhere with making your own watch parts, you need a CAD drawing of what you want to make. 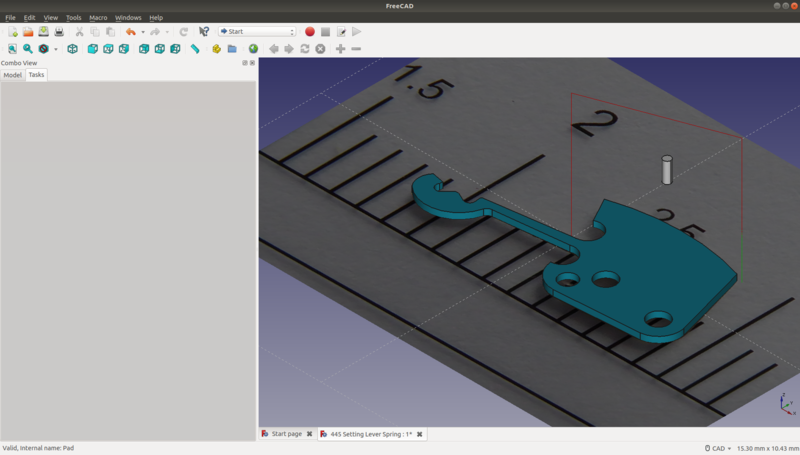 For me, this is new territory, and as a huge freeware fan (I write this blog post on my Ubuntu desktop), I download and try FreeCad. It’s a fantastic piece of software, as it lets you use a photo as a background for your drawing. You can see a setting lever spring here photographed in front of a millimetre scale. I have to adjust the photo size so that the millimetre scale exactly fits the drawing grid, and I have a 1:1 template to draw from. Easy-peasy! 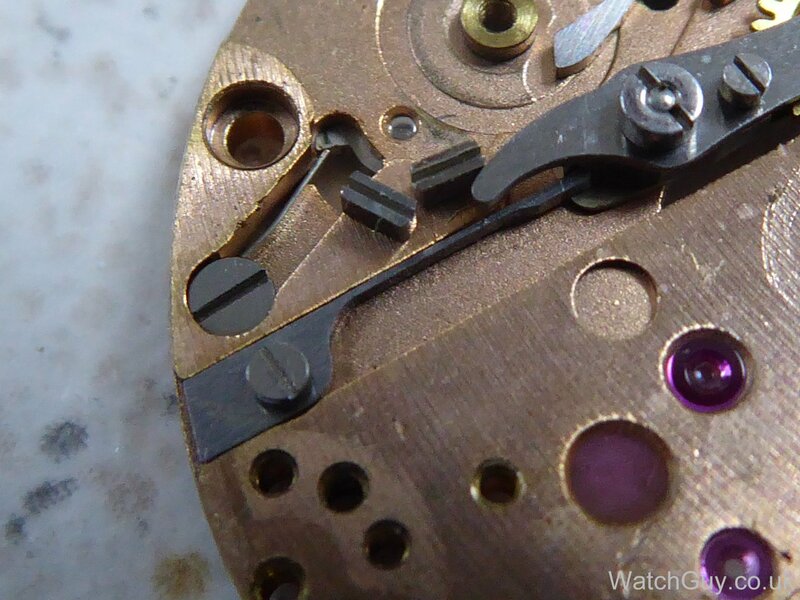 In the screenshot above, I draw an Enicar 1120 setting lever spring, as we have a customer watch in the workshop that has a broken one, and we can’t get a new one for love nor for money. I just put the broken bit on for the photo so that I know what I need. 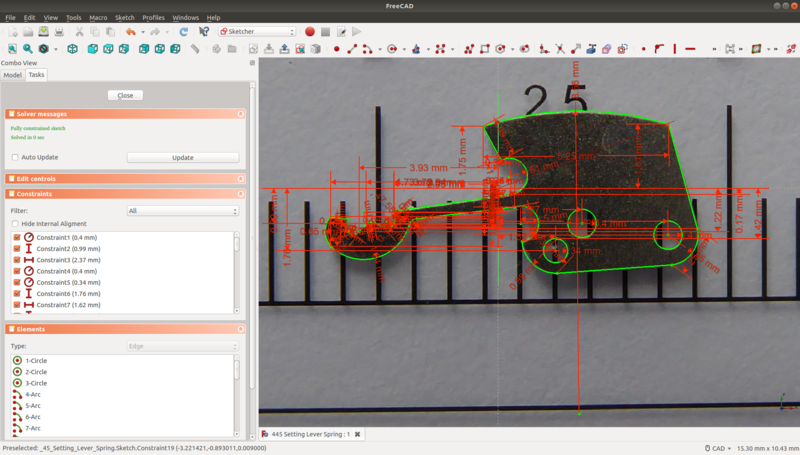 From drawing to 3D model is just one step – defining the height of the setting lever spring. 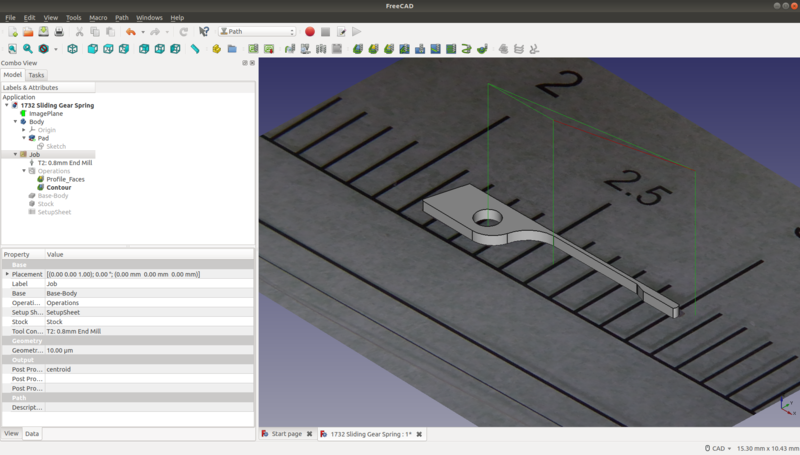 The next step is defining the tool path for the CNC machine, and FreeCad does that as well, and quite nicely so, too. 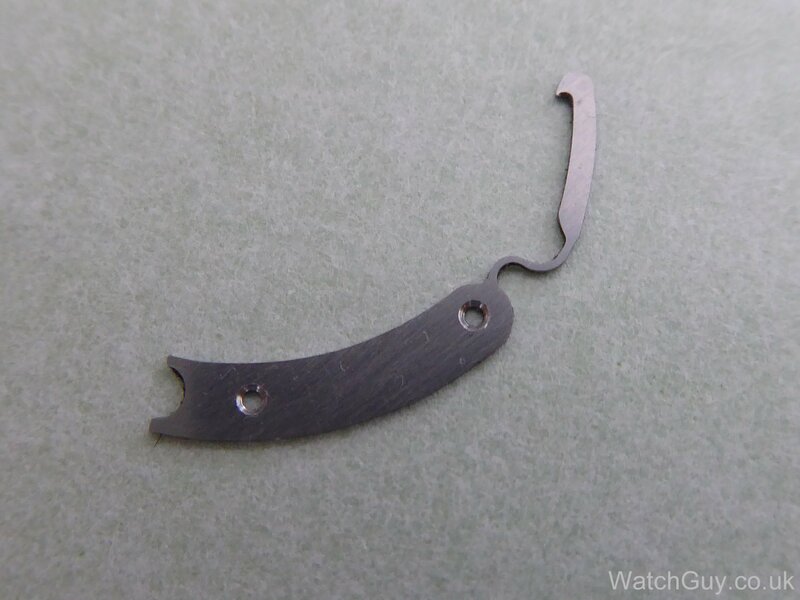 Choosing the right material is paramount, and I use a feeler gauge, as that’s exactly the sort of steel I want. Hard, but also springy. Now it’s time to cut out the setting lever spring. It’s not easy to find the right settings for r.p.m., feed rate and cut depth, and it costs me around 20 mills to get this right 😉 Apprenticeship money well paid, I’d say. Not that they are cheap. Straight out of the machine, and not a bad looking chap. The original spring didn’t have a great finish, so we don’t want to stick out like a sore thumb (and spend an hour polishing). The spring fits perfectly. As I had annealed the feeler gauge before milling, I harden and temper it before fitting it. The holes are a bit bigger than they should be, but I’ll get on top of that after a couple of days. We test the spring a hundred times or so, and all is well! A very happy customer, and a very happy WatchGuy. I have to try something more fiddly of course, and have a go at the Omega 320 1732 sliding gear spring. Hard to find, and often bent or broken. The main challenge is to get the drawing absolutely right, as the part won’t fit otherwise. Ray has a go this time, and produces a lovely drawing. And from a lovely drawing, the mill produces a lovely spring. 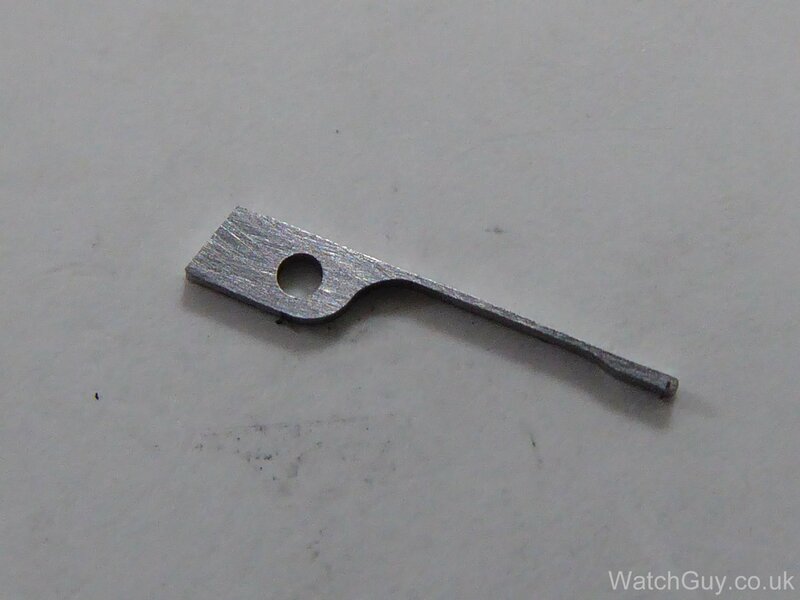 Note that the thin spring part is 0.13mm! This part is milled with a 0.8mm end mill. As always, proof is in the pudding, and the spring fits like a glove. On top of that, it behaves better than the original, as it’s harder and can’t be deformed. The original springs often are bent, and this one is just a tad harder. As parts are getting harder and harder to get, this surely has to be the way forward to produce yourself what you need. In due course, I will also attempt wheels, as the fourth axis motor is the right tool to do that. 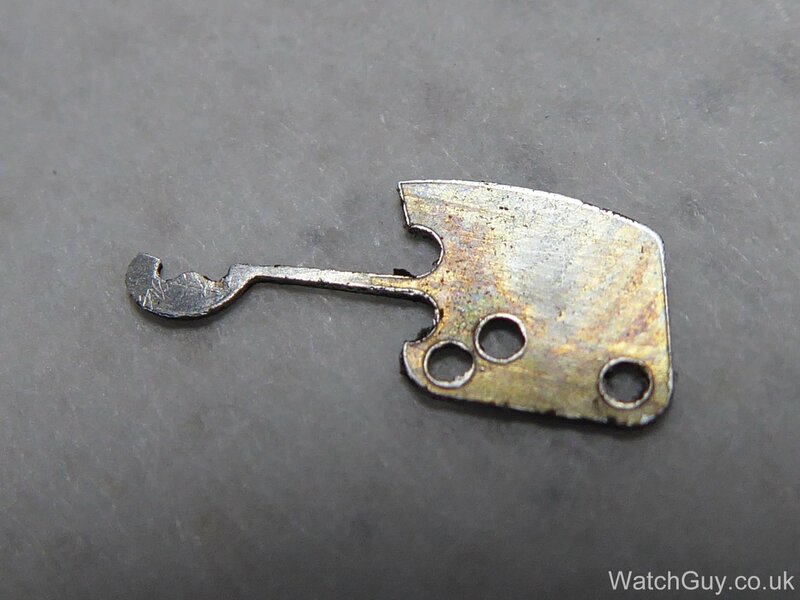 If you are a fellow watchmaker reading this post and you want to have a go yourself, send me an email, and I’ll invite you over and show you how to get going making your own parts. This post makes the whole process look very easy, but it took me 2 weeks from getting the mill to getting the first usable part out of it. A steep learning curve, but well worth spending the time on learning this new skill. 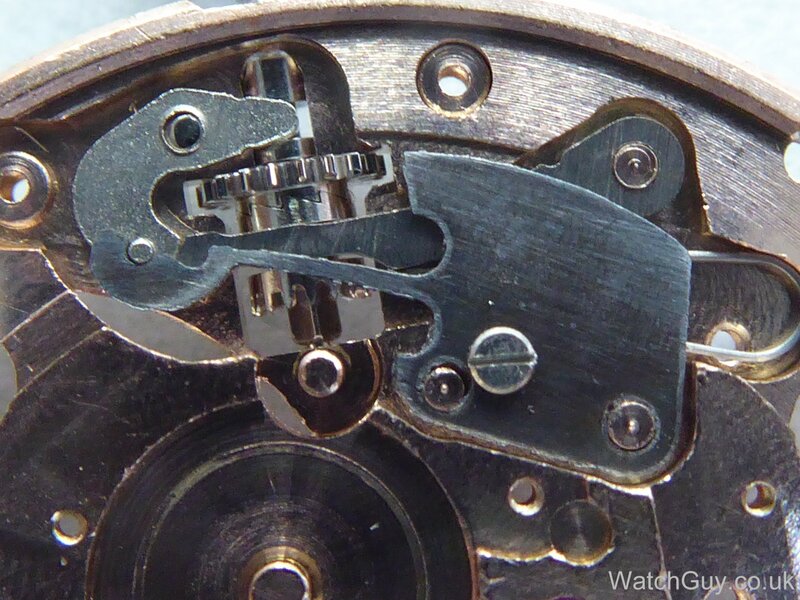 A nice little 1930s Rolex winding stem bridge. Less than 0.6cm across! Did someone say JLC FutureMatic oscillating weight hook spring? great job! 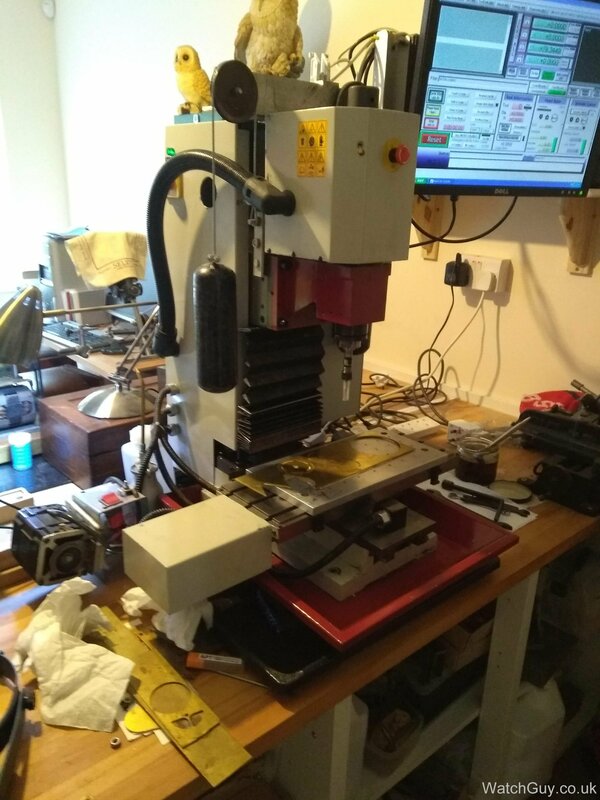 I see there are various models of 3040T CNC mill on ebay… Are you satisfied with yours? What is exact configuration, meaning what is working area and spindle power? I am kind of surprised with accuracy you get with that mill, especially if you can mill steel parts? 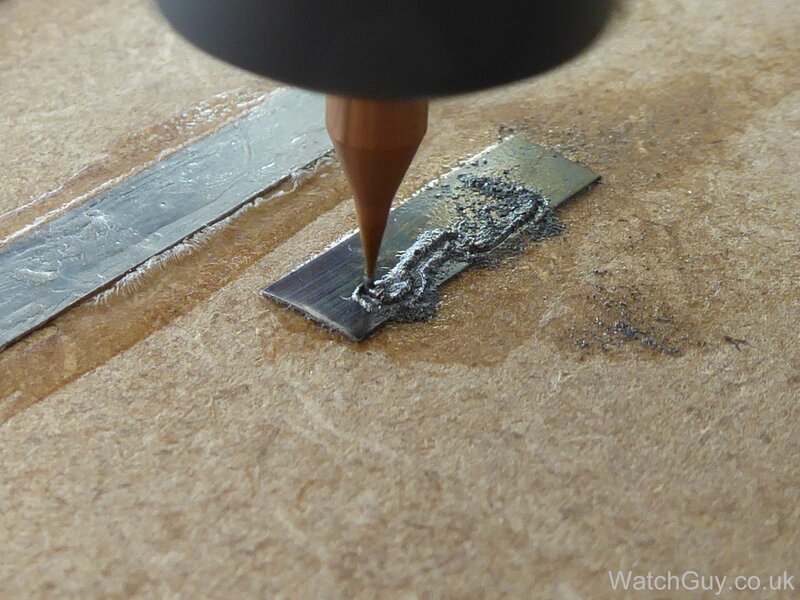 Surely will put it on this year’s “must have” tool and abandon mine “DIY CNC” long term project. Hi Christian. Fantastic work and very generous of you to share your files. One “custom” part that has crossed my mind for an application like this would be a modified date wheel spring for something like the ETA 2824-2. 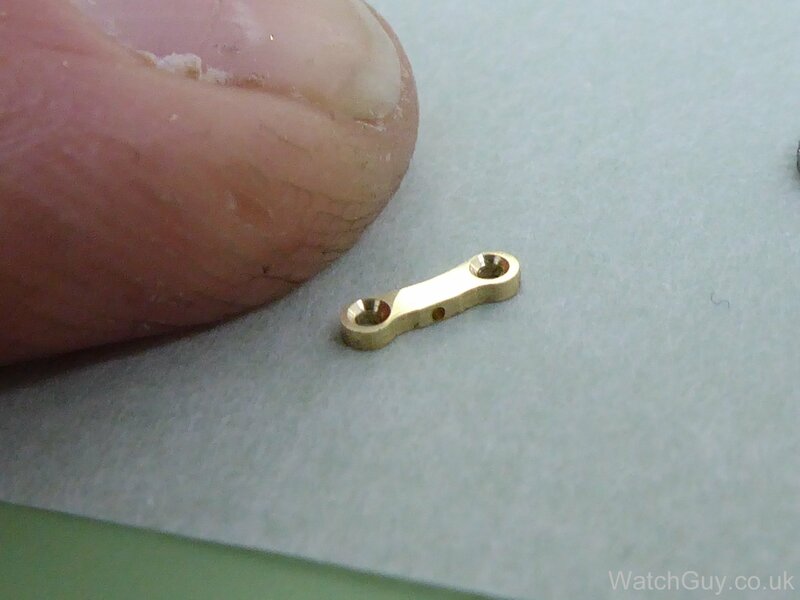 If you could make something that was half a tooth longer (or shorter) than the standard spring perhaps it could help converting many watches to a destro set-up with a left hand crown, enabling the date wheel to line up even if the dial was rotated 180°? Just a thought. Some modders have been prototyping watch parts on 3D printers, I’ve a bezel to get CNC’ed from one of those files, I didn’t realise they had dropped in price that much. Love the free source files you are creating. After reading about their withdrawal of spare parts to independent watchmakers, I wonder how long it will be before Omega claim “copyright infringements” and file legal claims to stop small-scale manufacturing like this. This is phenomenal, Christian & Team! that is amazing! in deed a great adquisition for your shop, doing the Parts yourself will put you at another level. so as you mentioned.. it looks like the most important part is the source drawing.. how does the program allows you to make the drawing? It would be awesome if you could make a video of the whole process. If you click on the YouTube link above, it will show you the process from photo to tool path for the machine. Wow, as you say surely the future. Ray’s spring is perfect! unbelievable for a first attempt on an £800 machine. Very interesting to see this technology applied to watchmaking! The company I work for used to be called Ferranti, and they used one of the very first computer-controlled milling machines in the 1950s, to manufacture the RF block for the AI 23 radar system – as fitted to the RAF Lightning aircraft. That certainly gives you the award of the earliest known cnc application! Good Lord, we are half a decade behind! yes it was seen as a big breakthrough at the time. Ferranti also designed and sold one of the very first commercially-available programmable digital computers, again back in the 1950s. Sounds like a dream job to have worked for them at the time. What’s not to love? At the forefront of technology, and developing something that would become mainstream in the end. Excellent! This is very much in the territory of what I do for a living, except our machines are £800k rather than £800! Fantastic Christian, when will you be making your first watch…? Surely just a matter of time! Wow this is a real game changer for us watchmakers and a education to watch your curiosity skills with your colleagues. i must say you are a good asset to us watchmakers. thank you for this new skill. Hi Christian. This is amazing as Jeff says. It’s a nice fit for your blend of skills. Nice photographs too; really helpful. This will definitely be a game changer for everyone with a vintage watch. This is amazing! You are such an asset to this industry!